Amicorp’s Pooled Omnibus Investment Trust (POINT) offers secure, cost and tax efficient structures for both individuals and institutions. POINT offers to a wide range of individuals the benefits traditionally associated with Trust and Company structures. POINT is a Barbados collective holding vehicle which maintains foreign bank accounts and portfolios, in a practical, tax and cost efficient manner, It enables institutions and professional advisors to offer a structure to their clients that is not only tax compliant, but also offers asset protection and estate planning benefits. POINT offers simplicity and cost efficiency. Our pooled solutions offer a holding vehicle which combines a simple structure with shared costs to produce an economically efficient product that provides considerable flexibility. Assets held in POINT can avoid local ‘forced heirship’ rules Participants can easily withdraw from the POINT at their discretion The fee structure is fixed, straightforward and economical. POINT is a composite Barbados structure comprising of a Barbados trust (“POINT Trust”) which holds a Barbados Protected Cell Company (“PCC”). The Trust at the top of the structure separates the legal ownership of assets held in each underlying share cell in the PCC from every other contributing participant for the duration of their participation in the POINT. During the participation in the POINT, a participant holds the beneficial (e.g., income) rights while the legal (i.e., ownership title) rights are held in the trust. As a result, all income generated by the assets of one cell share class (e.g., from investment activity) are not taxable to the beneficial owner (i.e., participant or designee) in their local jurisdiction. The income is likewise exempt from Barbados income taxation. The Trustee is a Barbados bank licensed by the Central Bank of Barbados . The management of portfolio investments held in each share cell can be assigned by the director of the PCC to the participant or their designee (e.g., investment banker, etc. As a result, a participation in the POINT only adjusts the manner in which the assets are held – the asset management remains as it was before participating in the POINT (or simply, as the participant desires). Estate/succession planning benefits are created through participating in the POINT. Should a participant pass away prior to their withdrawal from the POINT, assets held by the POINT can be transferred efficiently to the beneficiaries without any probate under Barbados law. This provides a tax efficient transfer of the beneficial ownership of a cell to the beneficiaries of the trust. The PCC has several ‘cell’ share classes, each able to hold specific segregated assets. The assets and liabilities of every cell share class are completely segregated and legally insulated from every other cell share class (and the assets therein) in the PCC. The intended legal purpose is to provide individual cell protection for the pooled assets of several investors into a single PCC entity. that same cell. 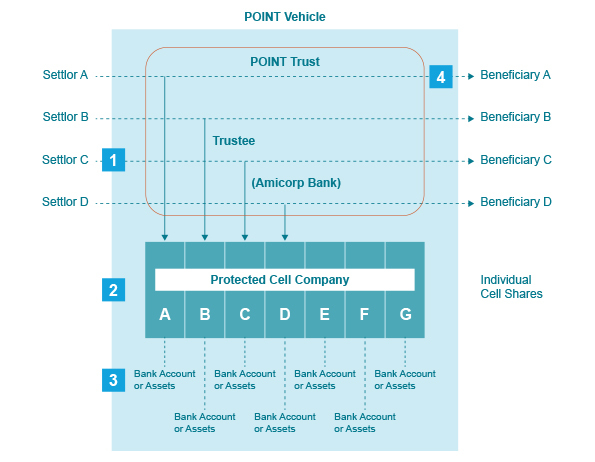 All cells have separate participating (voting) shares held by the POINT Trustee (i.e., Amicorp Bank and Trust Limited) for the benefit of each cell participant. Each cell share has a separate subscription specifying the assets held within each cell. The financial accounts of each cell are separately maintained, apart from every other cell class and any general assets of the PCC. Participation in the POINT can be liquidated easily. All assets held in the Trust (e.g., for the participants) can be swiftly distributed to accounts designated by the beneficiaries or the participant. Each cell is permitted to hold only one investment portfolio or bank account. Participants wanting more than one investment portfolio or bank account should subscribe for separate additional cells. POINT is offered as a ‘turn­key’ vehicle for individual and institutional clients alike. While fee may vary based on the AUM. A single low fixed fee can also be applied generally to any participation in a POINT. For individuals, POINT participation provides entry into the Trust and a dedicated cell class in the PCC for a participant’s asset. All legal work, the opening of any bank accounts in a correspondent bank (if required), the initial appointment of a participant (or anyone else designated) as the asset beneficiary, the manager of the assets and the transfer of income from their cell (if desired). Institutional clients can acquire their own POINT vehicle to be used exclusively for their own clients. Such a POINT includes the Trust and a PCC with a standard number of existing cell share classes, which can be increased as more clients participate. POINT brings great value to both individuals and institutions. Simple in design and operation, it provides uncomplicated access to estate planning, asset protection and economic efficiency. Individual clients may enter the Amicorp POINT. Alternatively, for institutions with groups of clients, a dedicated POINT may be possible, provided certain conditions are met. The simple fixed annual fees provide clients with security and cost control far superior to many similar individual structures. The numerous powerful benefits coupled with the ease of one’s entry and exit from a POINT makes the vehicle a smart choice among a plethora of other holding / asset protection structures. If you have any questions, we will be delighted to assist you. For assistance and further information, please contact your nearest Amicorp office or Amicorp Barbados.